Karina Bursac is one of the most unselfish players on Middleton’s girls basketball team. When it comes to championships, though, Bursac had no interest in going halves. “I don’t want to share,” Bursac said of the Big Eight Conference title. Middleton entered its game with visiting Madison La Follette last Saturday with a one-game lead over Sun Prairie. The Cardinals made things tough on themselves, falling behind the Lancers, 18-4, in the first 10 minutes. But Middleton rallied back, posted a 58-50 win and captured sole possession of the Big Eight title. Middleton finished the regular season 16-2 in the league, 17-5 overall and has won nine straight games overall. Sun Prairie (14-3, 16-5) finished one game back of Middleton. Middleton won the league for the fourth time in the past six years. SUN PRAIRIE — “Cobra! Cobra!” Middleton girls basketball coach Jeff Kind bellowed. This is the Cardinals’ terminology for their 1-3-1 zone defense. And just like the venomous snake itself, that defense can choke the life out of foes. Just ask Sun Prairie. In a Big Eight Conference showdown last Thursday, host Sun Prairie led Middleton, 28-15, late in the first half. After Middleton switched to ‘Cobra’, it immediately embarked on a 26-4 run. That switch — and the effectiveness of Middleton’s 1-3-1 zone — helped it notch a 53-45 win that clinched at least a share of the Big Eight Conference title. When Middleton defeated Madison La Follette two nights later, it captured the league title for the fourth time in six years. Middleton finished the regular season 16-2 in the league and 17-5 overall. Sun Prairie ended the regular season 15-3, 17-5. Like two heavyweights, Middleton and Madison West took each other’s best shots. Back and forth they went until the Regents finally pulled away late at last Saturday’s WIAA Division 1 state meet held at the UW Natatorium. But, while West went on to win the decision, 314-257, the Cardinals certainly had their moments on their way to a second straight runner-up state finish. One of those came from Middleton’s foursome of senior Archer Parkin, junior Nate Lamers, senior Andrew Martin and junior Forrest Peterson, who won the 200-yard freestyle relay in a state record time of one minute, 23.12 seconds. “That was a pretty incredible race,” Martin said. “I was so excited, everyone was just swimming lights out. You could tell we wanted it so bad. Kevin Meicher and Joseph Hoffman have wrestled together since the third grade. They are practice partners at Middleton High School. And they avid supporters of each other. Now, the two senior standouts will end their high school careers at the state tournament together. Meicher won the WIAA Division 1 Verona Sectional championship at 152 pounds last Saturday, while Hoffman finished second at sectionals at 145 pounds. Both wrestlers earned places at the state tournament, which runs Thursday through Saturday at the UW Kohl Center. Middleton’s boys basketball team earned the No. 6 seed in its 18-team postseason sectional. The Cardinals received a first round bye, then open the playoffs in a regional semifinal against 11th-seeded Janesville Craig on March 1 at 7 p.m. Middleton, which is 13-8, split with the Cougars (10-10) during the regular season. If the Cardinals win there, they would likely travel to third-seeded Madison La Follette on March 2 at 7 p.m. for a regional final. The sectional semifinals are March 7 and the sectional finals are March 9. Jack Boyle insists he wasn’t nervous. He might have been the only one at Middleton High School who wasn’t panicky. 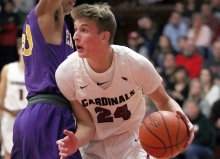 Boyle, a senior guard, stepped to the free throw line with 2.0 seconds left last Wednesday with the Cardinals and visiting Janesville Parker deadlocked at 55. Boyle then calmly drained both free throws to give Middleton a too-close-for-comfort 57-55 win. Middleton also dropped a 56-48 decision at Sun Prairie last Friday and is now 13-8 overall and 10-7 in the Big Eight Conference. The Cardinals, who are in fifth place in the league, host second place Madison La Follette (11-4, 14-5) Thursday at 7:15 p.m.
Boyle led Middleton with 14 points in its win over Parker. Senior guard Chandon Thomas added 11 points, five rebounds and three assists. Middleton’s girls gymnastics team finished sixth at the Big Eight Conference meet last Saturday. Sun Prairie won the meet with 135.35 points, while Madison Memorial (134.65) and Janesville Craig (132.3) rounded out the top three. Middleton was sixth at 130.825. “I was actually pleased with the sixth place finish,” Middleton coach Kari Steck said. “We have a strong conference this year, and a young team. The girls have shown a lot of growth in their routines this year, which can be contributed to their hard work. Cardinals senior Jordan Baggot tied for the all-around championship with a score of 34.45. Baggot won the floor exercise with a 9.30, was fourth on the balance beam (8.90) and fourth on the vault (8.70).